Danvers – Pauline A. 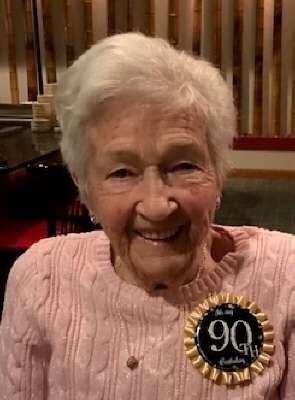 (Lockard) Zwicker 90, wife of the late William S. Zwicker, died Wednesday, October 31, 2018 at her home surrounded by family. Born in Lincoln, Maine, she was the daughter of the late Alfred and Augusta (Orser) Lockard. She was raised in Salem and received her education in the Salem School system. Mrs. Zwicker had been employed for eighteen years as a nursing assistant at the Beverly Hospital until the time of her retirement. A resident of Danvers for over twenty years and prior to that in Beverly, Pauline was an avid sports fan, especially for the New England Patriots. She enjoyed traveling and spending time at the Peter A. Torigian Senior Center in Peabody where she played cards and bingo with her friends. She was a loving mother, grandmother, great grandmother, sister and friend who will be missed by all who knew her. She is survived by her daughter, Paula R. Eaton of Haverhill; three sons, David S. Zwicker and his wife, Nancy of Danvers, Mark W. Zwicker and his wife, Joanne of Groveland and Deane A. Zwicker of Rochester, NH; twelve grandchildren; twenty great grandchildren; two brothers, Eugene Lockard and his wife, Gerry of Salem and Oakley Lockard and his wife, Gloria of Hamilton and many nieces and nephews. She was also the sister of the late Ruth Jones and Burrill, Alfred, David, Patrick, Harvey and Lawrence Lockard. Her funeral service will be held at the Campbell Funeral Home, 525 Cabot Street, Beverly, Sunday, November 4, 2018 at 2 p.m. Relatives and friends are invited to attend. A visiting hour will be held prior to the service on Sunday from 1 - 2 p.m. Contributions may be made in her memory to Peter A. Torigian Senior Center, 75R Central Street, Peabody, MA 01960 or the American Heart Association, 300 5th Ave, Waltham, MA 02451. Information, directions, condolences at www.campbellfuneral.com. To send flowers or a remembrance gift to the family of Pauline A. Zwicker, please visit our Tribute Store. "Email Address" would like to share the life celebration of Pauline A. Zwicker. Click on the "link" to go to share a favorite memory or leave a condolence message for the family.